This recipe for Apricot Amish Friendship bread was shared with us by Kitchen Friend Linda Delescale and is a wonderful, sweet and spicy variation. 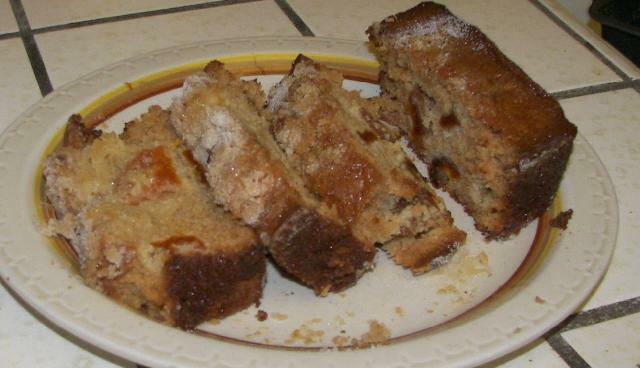 This recipe for Apricot Amish Friendship Bread is a wonderful, sweet and spicy variation! In a large bowl, add starter, oil, milk, eggs and vanilla. In a separate bowl, add flour, sugar, baking powder, cinnamon, ginger, caradmon, baking soda, salt and instant pudding mix. Add in the apricot jam and the dried apricots. Dust the greased pans with half of a mixture of ½ cup sugar, 1 teaspoon ginger and ¼ teaspoon cardamom. Pour the batter evenly into loaf pans and sprinkle the remaining sugar mixture on top. I made this bread at a friend’s request for Thanksgiving this year. By Sunday I wanted to something different with the leftovers and so french toast – delicious!